Fungus has taken over the Spiral Gallery. 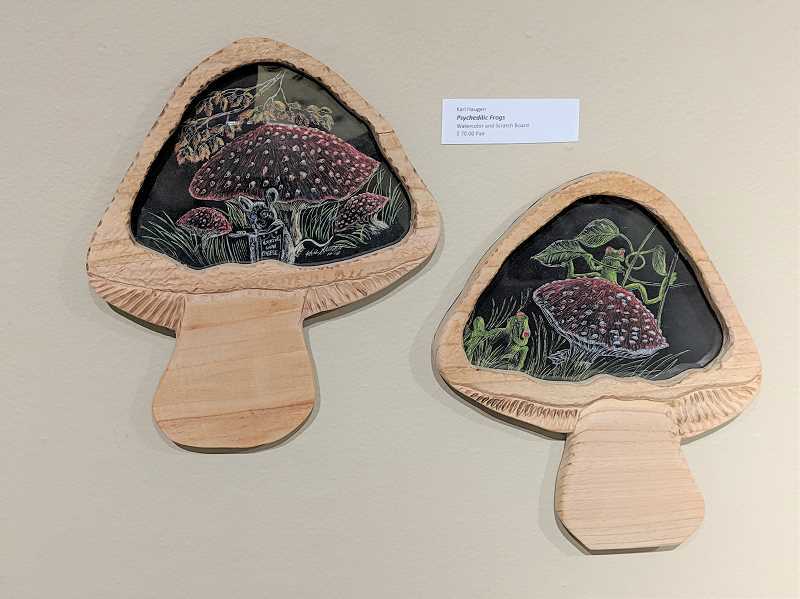 This month's group show — "A Fungus Among Us" — features mushroom-inspired pieces by members of the gallery. The collection of art that will hang through the end of this month includes everything from paintings and furniture to hats and jewelry. Among the artists with work in the show are jewelry maker and painter Sue Dumolt and fiber artist Annette Reisbick. Reisbick created two hats and a shawl and Dumolt made a necklace and a small painting. One of Reisbick's hats was inspired by the shaggy mane mushroom. "I knitted a gray hat with a little shaggy in it," she said, explaining how she made the hat look like a mushroom. Reisbick's other hat is felted and features a depiction of an amanita mushroom — the well known red and white fungus. Dumolt's necklace depicts a silver mushroom, and her painting was inspired by a trip to the woods in which she found a ganoderma mushroom, which resembles a fried egg. Dumolt appreciates having a theme to work with when creating her pieces. "It makes your creative juices flow more with a creative target and you have to ask how you'll use your skills to make something representative of it," Dumolt said.